Court Cairns are among the oldest Megalithic Tombs in Ireland. Most of these tombs were built in the northern half of the county. 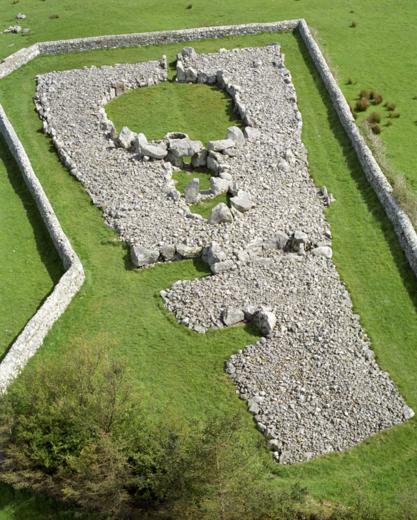 A Court Cairn is a tomb consisting of two sections ; a Gallery ( This would originally have been covered) and a Courtyard. The Cremated remains of the dead were placed inside the covered Gallery. It is believed that the open Courtyard was used for ceremonial purposes. The whole Court Cairn would have been covered over by a mound of small stones called a Cairn. In the centuries that have passed the Cairn in all the Court Cairns have since collapsed, leaving the internal stone structure remaining. Drawing showing the open Courtyard and the Gallery covered by a cairn of small stones. In this video watch out for the amount of stones that were used to make the cairn. These stones are now collapsed and lay scattered around the tomb. This article was written by Deirdre Morgan.